Can you confirm these amateur observations of Amerotyphlops arenensis? Types Holotype: MZUSP 20042, An adult male, collected by Gentil P. Filho on 19 November 2008. Paratypes. Eighteen specimens all collected in the type locality by Gentil P. Filho. MZUSP 20037–38 collected in 16 October 2008, MZUSP 20039 collected in 17 October 2008, MZUSP 20040–41 collected in 19 November 2008, MZUSP 20136 collected in 19 November 2008, MZUSP 20043–45 collected in 17 December 2008,MZUSP20046 collected in 18 December 2008, MZUSP 20047 and MZUSP 21273 collected in 21 January 2009, MZUSP 20048 collected in 28 February 2009, MZUSP 20049–50 and MZUSP 21274 collected in 27 March 2009, MZUSP 20051 collected in 23 April 2009, and MZUSP 20052 collected in 21 May 2009. Diagnosis Diagnosis. 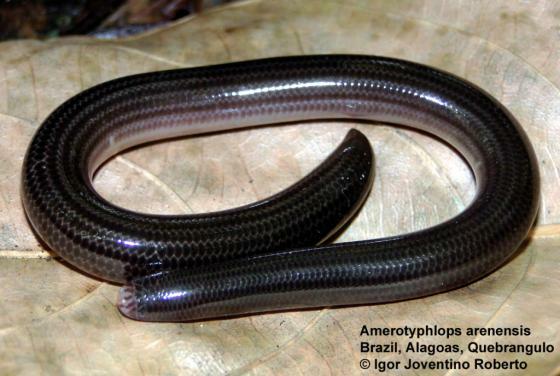 Amerotyphlops arenensis is distinguished from all other South American species by the following combination of characters: nasal suture incomplete; rostral scale oval; supralabial scales four; infralabial scales three; rows scales around the body 18/18/18; middorsal scales 204 to 225; rows of dorsal scales dark brown 12–13th; rows of ventral scales yellowish cream and immaculate 4–5; caudal spine dark brown; subcaudal scales 8–10 in female and 11–13 for males; and maximum TTL 233 mm. The new species differs from Amerotyphlops lehneri by having an incomplete nasal suture (vs. complete nasal suture); from A. brongersmianus, A. reticulatus, and A. minuisquamus by having 18/18/18 rows scales around the body (vs. 18/16/14, 18/18/14, 20/18/14 or 20/18/15 in A. minuisquamus; 20/20/18 or 20/20/20 in A. brongersmianus and A. reticulatus); from A. yonenagae by having less than 250 middorsal scales (vs. more than 250 middorsal); from A. amoipira by having highly pigmented cephalic scales with a dark brown dorsum (vs. few pigmented cephalic scales, creamish brown dorsum with a fine darker brown paravertebral line concentrated in the anterior part of the body) and from A. paucisquamus by having a largest number of middorsal, between 204–225 (vs. fewer number of middorsal, between 162–209). Etymology Etymology. The specific epithet is derived from the Latin name “arena”, a reference to the name of the type locality of the new species, the municipality of Areia.